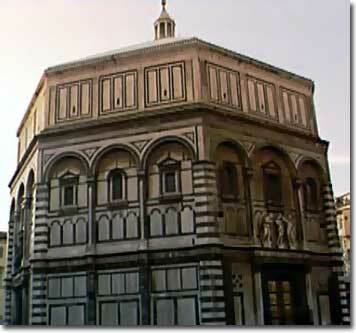 The octagonal Baptistery is one of the supreme monuments of the Italian Romanesque style and one of Florence's oldest structures. It stands in the Piazza del Duomo, just to the west of the Duomo. Until the end of the 19th c. all Catholic Florentines were baptized in this church. The round Romanesque arches on the exterior probably date from the 11th century. The interior dome mosaics from the beginning of the 14th century. In 1328-1336 the south doors were cast in bonze by Andrea Pisano. The era's foremost Tuscan sculptors each designed and cast a bas-relief bronze panel depicting his own vision of The Sacrifice of Isaac. Ghiberti's north doors depict scenes from the life of Christ; his later, east doors (dating from 1425-52), facing the Duomo facade, render scenes from the Old Testament. The original Ghiberti doors were removed to protect them from the effects of pollution and acid rain and have been beautifully restored; they are now on display in the Museo dell'Opera del Duomo.